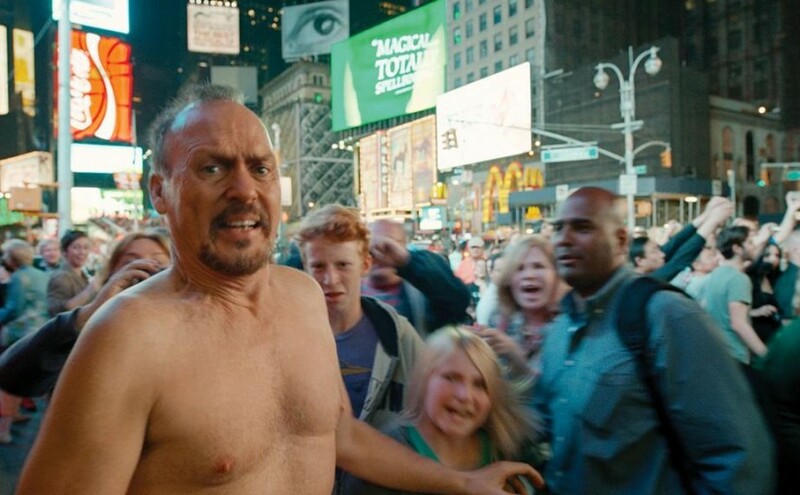 The central casting of Michael Keaton in Alejandro González Iñárritu’s Birdman is an inspired choice. Immediately it hints at a playful, self-reflexive work likely to have Hollywood in its sights. Utilising the guy who made Batman flesh a quarter-century ago as an ageing thespian keen to move on from long-gone superhero glories to be taken ‘seriously’ is an unambiguous, wonderfully preloaded set-up. Peek beyond the stage curtain, however, and the frenetic Birdman has many more feathers in its cap. Riggan Thomson (Keaton) is launching a counter attack on the critical elite that has decreed he is a spent acting irrelevance. He’s mounting a new theatre production on Broadway. But there is trouble in the wings. Haunted by the film’s title character, he’s unable to escape the fantasy hero he’s most known for. As the pressure mounts in the run-up to opening, that fantasy bleeds increasingly into reality. Throw in a questionable stage ‘accident’ that waylays a key cast member, and the meltdown ingredients are perfectly mixed for someone already doing his utmost to keep psychological crisis at bay. Michael Keaton brilliantly inhabits the harried star making a last claw at credibility. Always in a flap, he’s continually stalked by the sneering shadow of former commercial success. And flocking around the balding, despairing Thomson is a particularly fine ensemble cast. Zach Galifianakis plays against well-established comic type as the producer trying to keep control of proceedings. When the man known for a much more manic brand of comedy is touted as the level-headed problem solver of the enterprise, the whole venture gains a barely-held-together, teetering-on-the-edge excitement in one fell swoop. Edward Norton is clearly relishing vamping it up as Mike, the cocksure and arrogant eleventh hour substitute. His narcissistic indulgences only add to the threat to topple the production from within. To balance, Naomi Watts counteracts his volatility with the serious focus of an aspiring actress. Her beady eye is trained solely on advancing her career. While Emma Stone, alienated daughter sick of her dad’s self-obsession, could be interpreted as the disdain today’s media savvy youth has for a movie industry struggling to keep up with its most vital demographic. The film’s key strength, though, is its staging. In the style of Hitchcock’s Rope (1948) or the technically stunning Russian Ark (2002), it’s mounted as a ‘one take’ presentation. We follow Riggan and company, pinballing from wings to stage, outside to Broadway and back, in one ‘never ending’ shot. It is a logistical masterwork. Echoing Hitchcock’s early classic, the edit points are easy to spot, if you’re looking out for them, but they never detract from the momentum as we careen through the chaos. Spontaneous disarray of this degree takes meticulous direction of the finest precision. Beyond placing Hollywood under the spotlight, Birdman spreads its wings further to prey on the fallibilities of the psyche in all dramatic arts. Confidence, fragility, infatuation, pretension, delusion, self-doubt, self-loathing …all the characters collide, fuse and spark off each other, informing a fraught contemplation of the actor’s trade. Such inward examination may raise the hackles on the necks of some, but it is a fitting expression of the very egotism under review. Thomson is a joyously flawed antihero of comic anxiety, his alter ego a terrifying spectre of self-judgement. As ramshackle in its styling as the clattering soundtrack, their interwoven story threatens to tumble out of the sky at every turn. But uplifted by a uniquely original concoction of premise, production and players, Birdman ultimately soars to the highest of perches.